Kamen Rider (or Masked Rider in English) to the world of costumed superheroes has been like what sushi is to the culinary world. It’s something that few people really know about, and even fewer have bothered to try out, mostly due to poor marketing in the US and one really bad adaptation for American television (the less said about Saban’s version of Masked Rider, the better). 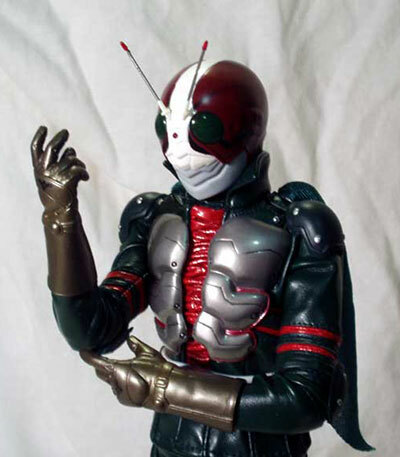 Just like sushi however, Kamen Rider has always been a popular, almost dominant, force in the superhero fandom here in Asia and has also built up a steady devoted cult in the US. If Ultraman is the Superman of Japan, then Kamen Rider could very easily be Japan’s version of Spider-man (his cyborg powers were forced upon him against his will), or even Batman (many incarnations use all sorts of gadgets). Kamen Rider has undergone many different incarnations and changes, with all kinds of gimmicks to keep the franchise fresh. With ‘Riders’ having motifs from all kinds of insects and animals, to using gadgets like cards, sentient robot bugs and even cell phones, it’s pretty easy for a newbie to get lost and confused. It was a smart move then, for Toei, to commemorate the franchise’s then 35th anniversary with the 2005 movie Kamen Rider The First, which brought the franchise back to its roots with a retelling of the original show’s tale. 2 years down the road, and the movie was successful enough to gain a sequel, aptly titled Kamen Rider The Next, which was also a retelling of Kamen Rider V3, the original follow up to the original TV series. Although I have never really followed Kamen Rider much at all as a child, with exception of having played a random game he happened to cameo in or two, I have always had a love for superheroes American and Japanese alike. Having first set my eyes on the designs for the original two Riders in The First (and enjoying the movie too), then obtaining Medicom’s 12 inch figures of them, I simply had to get the third Rider, V3, as well. So as soon as he was announced, I put my preorder down and waited for long, agonizing weeks. Soon however, he was in my grubby little hands! This is the fifth release by Medicom under their ‘BM! Project’ label, in which they have collaborated with Bandai to bring you this fine product. 5 releases down the road and they have not strayed too far from their formula in regards to their packaging. It is clean, simple, and looks really attractive and ‘premium’. The box is of a good quality cardboard with a matte feel, and has a front velcro secured flap that reveals some pictures of V3 himself, details on his features, and of course a window where you can see the figure itself. Some background text on the movie would have been good, but it’s not a huge deal as the power of the Kamen Rider name should be enough to speak for itself. The packaging is also very collector friendly, with no twist ties, and using a clean and simple plastic tray, allowing you to put V3 back into the box as easily as taking him out of it. 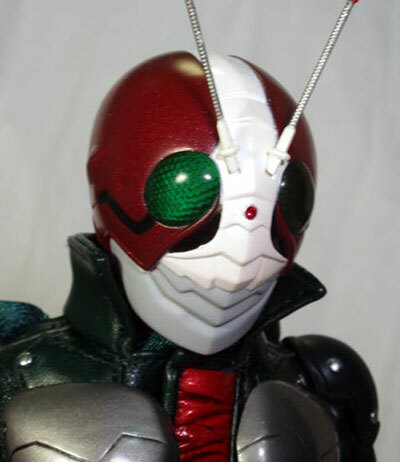 The main essence of a Kamen Rider’s design has always been his helmet, if that was not obvious enough. Medicom has always excelled at sculpting armored characters, and that expertise shows off extremely well here. V3’s helmet is sharp, and looks extremely faithful and accurate to the source material. He has plenty of groove lines on the front and the sides of the helmet, and his mouth piece has a nice layered look that makes it look almost removable (even though it’s not). The best detail here however, has to be the eyes of helmet, with Medicom having nailed down the ‘bug’ motif perfectly. The eyes are cast in clear plastic, and have a segmented look to them that is simply exquisite. 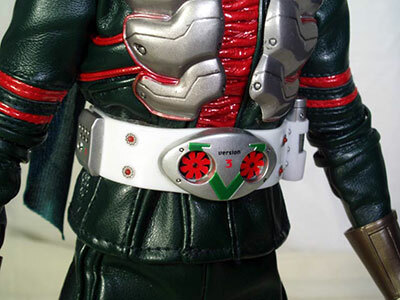 V3’s transformation ‘Double Typhoon’ belt is chock full of details as well, with the huge silver buckle with the words ‘Version 3’ imprinted on them. Accompanying that are the twin ‘typhoon’ cylinders at the side, and even the molded pouches at the side have little grooves sculpted onto them with words like ‘Version Hopper’ printed on. The Bandai/Medicom alliance has worked extremely well for the Kamen Rider figures thus far, and it’s great to see that this level of quality and care continues. There isn’t a whole ton of paint on V3 except for the chest plate, belt, boots and helmet. There is a tiny bit of bleeding on the front of the helmet, where the white meets the red, as well as on the black groove lines along the sides. There is also a bit of bleeding on the silver chest plate as well, with a tiny dot of silver having escaped and planting itself on the fabric underneath in my piece’s case. I have also heard about some other people’s V3s having a crooked ‘Version’ print on their belts, but that wasn’t the case with mine. Aside from these matters, there isn’t too much to complain about here. There is a very mild wash on the chest plate that really lends to the realism and the boots even have a nice little gradient effect on them. Overall, it’s solid work through out. V3 uses Medicom’s RAH 301 Kai body, and I’m sure it has been stated on Michael’s site numerous times by now that this is one of the most articulated bodies on the market that hangs really naturally. I am a relative newbie to the 12inch scene, but I can definitely see that these claims are totally true. 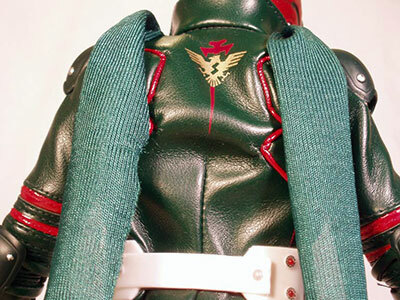 V3 has most of the points of articulation you’d expect on the 301 Kai – shoulders, head, neck, thighs, hips, etc etc. Perhaps the only real huge weaknesses here are the wrists and feet. 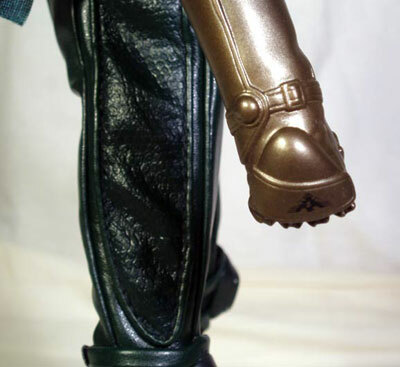 The gloves are cast in one whole piece that slip onto the forearms, with the underlying figure having no hands of its own and likewise, it is similar for the boots. 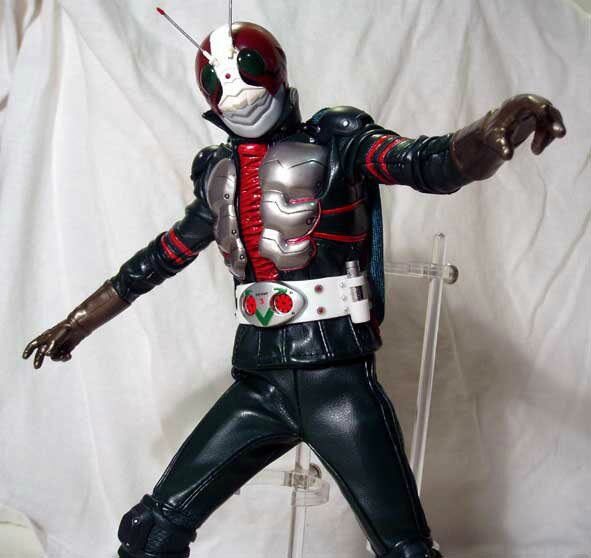 This is a double-edged sword in that while it definitely looks sharp and helps to maintain a realistic body line, this also means that V3, and indeed, his other fellow Riders in the same The First and The Next lines, lack wrist and ankle articulation. While this is not such a big deal for the wrists, as the gloves can be swiveled on the forearms to accommodate various poses, it is a slightly bigger matter for the feet and ankles. As the feet are not able to bend on their own, this makes it a touch tricky getting him to stand in wide stances on his own. He can do it, but it takes a bit of practice balancing him out, with the inability to pivot his feet flat on the ground, and the loose fit of the boots. Certain poses also tend to look a bit unnatural with the feet being unable to pivot, but one can work his way around that. 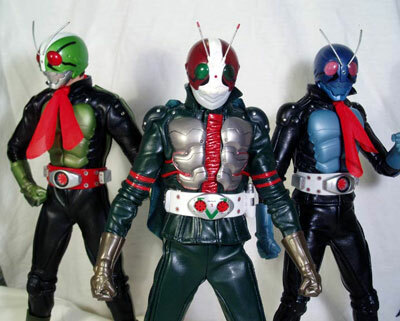 This is perhaps the second relatively huge weakness to V3, and the other classic Riders for that matter, in that there is a huge lack of accessories. The classic Riders have always been able to pummel their foes into little pieces with just their kicks, punches and even backbreakers. With this rationale, it is somewhat expected that V3 comes with no accessories aside from 3 extra pairs of hands in various poses (default closed fists, open hands, flat open palms, and ‘henshin/transformation’ pose hands) and the standard clear Medicom stand. While it is not totally surprising, considering his price point, Medicom could have included an ‘unmasked’ head or something, but no such luck here. The outfit is the usual high quality Medicom standard. The outfit’s design is sleek and accurate to the film’s, with a chest plate, and shoulder/elbow/knee pads that all fit nicely. Highlights here are the nice, deep metallic red color of the boots and helmet, as well the ‘Shocker’ bird logo that adorns the back of the jacket and the gloves. 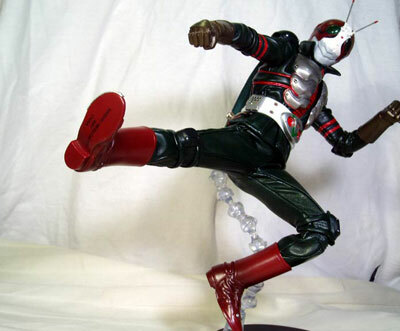 The stitching is also good and strong, which is a great thing as every Kamen Rider fan knows that any good Kamen Rider toys needs to be able to do the trademark ‘Rider Kick!!!’. It would be most unfortunate (and embarrassing!) 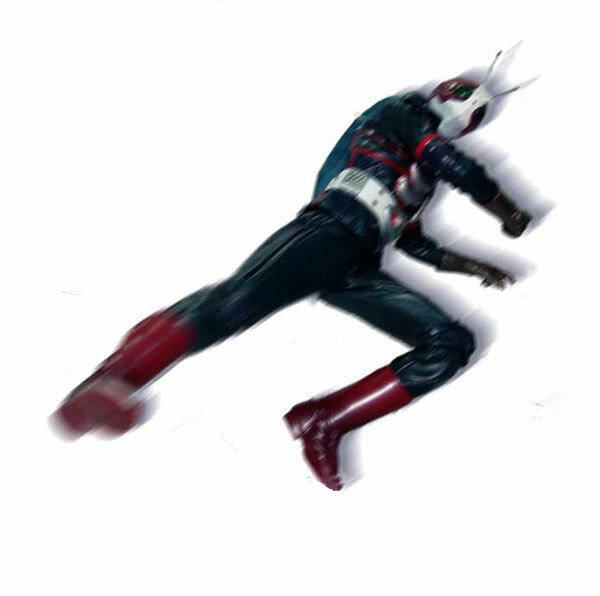 if a Rider’s pants were to split open the instant he tried to finish off his foe. Perhaps the biggest issue with the outfit amongst collectors is the color discrepancy between the final toy and the promotional pictures. The promotional pictures showed his outfit to be a brownish green, while the actual figure has a darker olive green outfit. While many collectors have voiced displeasure in this color difference, it does not matter to me too much. The color still looks good, photographs well, and most importantly, it’s actually more faithful to the source material. As always, a figure of this price point and caliber is not meant to be taken to the playground with, but it is able to withstand an adult collector’s fiddling. The outfit’s stitching is strong and won’t tear on you as long as you aren’t adamant on making V3 imitate a contortionist, and he looks simply awesome in whatever poses you put him in. Even if you aren’t familiar with Kamen Rider, anyone who loves their superheroes with a whole lot of flash and a tiny bit of cheesiness will find something to like here. It’s not news that Medicom’s figures aren’t the cheapest around by any stretch of the imagination. V3 is expensive, and his price can only get higher. The high price, the relative obscurity of the source material and the lack of accessories all make it rather difficult to recommend him to anyone who is not a serious Kamen Rider fan with a large budget. Be careful with the joints while you pose him, as is the case with most Medicom figures. He can withstand lots of posing, but don’t ever get all gung-ho on him lest you crack a joint or split a thread. The antennae on his helmet can also pop out and get easily lost if you’re not careful, though thankfully, Medicom has included a spare pair. Aside from all these, you should be good to go. 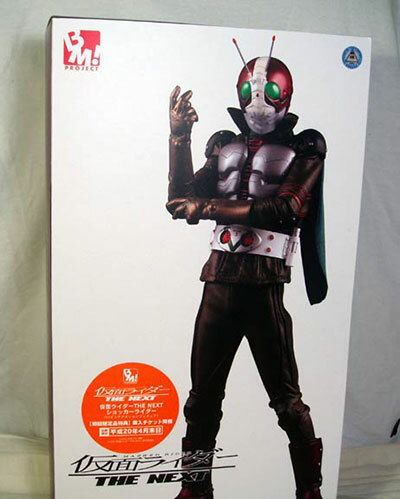 The appeal of this figure lies heavily on how big a Kamen Rider, or Japanese superhero fan, one is. For the casual collector, I would advise thinking carefully about whether or not to purchase him for he most definitely does not come cheap. If money is not much of an issue, then by all means go for it, but act quick as his prices are climbing fast. 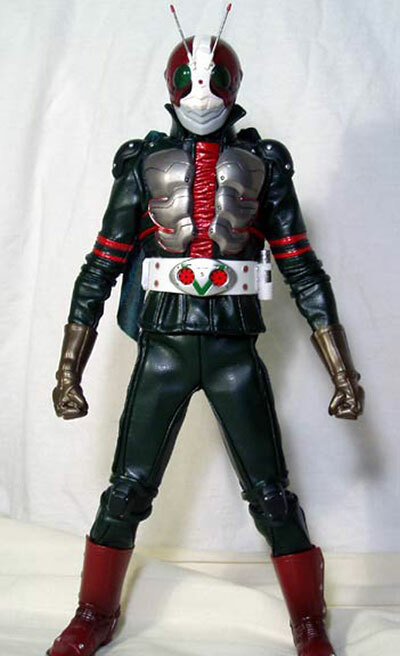 If you are a huge fan of Kamen Rider, and would love a premium figure that represents an awesome redesigning of a classic character, then I cannot recommend this figure enough. 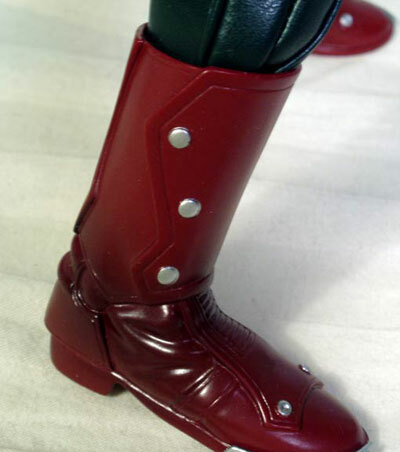 V3 is simply a great example of how to perfectly blend old and new, as much as he is a great blend of a premium collectible and an action figure. I got mine from HobbyLink Japan, but as a preorder and he’s long sold out. They do occasionally restock, but that is pretty rare. Some Hong Kong based sites like Action-HQ do have him in stock, as does Ebay. Prices range anywhere from 240-300 though, and seem to be climbing, so act fast. Figure from the collection of Yong Qiang Koh.